IBM is one of only a few companies that carries out pure research in technologies for the future. Most technology players invest their research and development budget in areas that have already achieved a breakthrough and need to be developed into commercial products. Last week, IBM held an event for analysts at its research labs in Zurich to discuss its progress with blockchain, crypto-anchors, quantum computing, post-quantum cryptography and neuromorphic computing. Blockchain is a major area of investment for IBM and it has set up a business unit to build the area. The company’s focus is on developing commercial applications for the technology, rather than using it for cryptocurrencies like Bitcoin. It believes that businesses do work in networks, and that could be a group of business units within a large organisation, or members of a supply chain or an ecosystem. It also believes that blockchain opens an opportunity for large efficiency gains. Historically, all members of such a group have kept separate ledgers, leading to huge duplication of work and discrepancies. With a blockchain, they could all work from a single ledger. One example where this technology could be used is in helping to create trust in physical objects, which leads into the crypto-anchors area. Counterfeit goods are a huge problem worldwide, particularly for some products like small, cheap medical devices. IBM cited an estimate by the World Health Organisation that 8 percent of medical devices are fake, including those that test for pregnancy, malaria and Aids. The issue also applies to drugs, as they could be past their use-by date or may have been tampered with. To tackle this, one of several approaches that IBM suggests is “microfluidics”, a technique that involves using inkjet technology to print a tiny code on each device. A smartphone camera can read this code, allowing an app to verify that the product is genuine — assuming the app is genuine, of course. This type of code has a vast number of possible combinations so, in theory, it would be possible to print such a code on items as small as an individual pill, at a cost of tiny fractions of a cent per item. 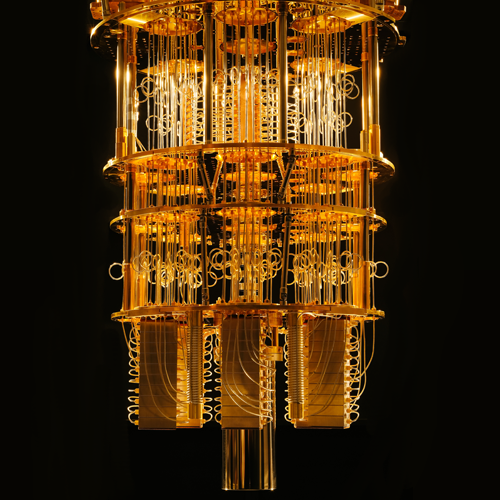 IBM is also putting a lot of emphasis on quantum computing. It’s one of the companies pushing this area forward along with Microsoft, Google, Alibaba and others. Quantum computing brings the prospect of exponential rises in computing power to help address some of the “hard” maths problems that are commonplace in industry. These are challenges where the complexity of the computation grows more and more rapidly, and they include risk analysis, cryptography, machine learning, the travelling salesman and logistics problems, complex system optimisation and so on. Quantum computing is technically very tricky and not enough people in the world even understand it. However, IBM is confident that these obstacles will be addressed quickly, based on the rate of progress the industry has seen in traditional computing and the advances being made with quantum computing. IBM has made an initial effort in this area by setting up a Web site, linked to a 2017 quantum computer, so that people can start to use it and learn about the area. This already attracts 80,000 users. One not-so-positive effect of the arrival of commercial quantum computing is that at some point in the coming years there will be a “Quantum Day” — a landmark moment when there’s enough processing power to crack all of the cryptography schemes currently in use. This is a terrifying prospect with two main implications. Firstly, we need new cryptography standards that are resistant to that level of computing power. These exist in the form of lattice cryptography and there are standards currently being developed in this area. Secondly, we need to implement these new schemes, and that will take several years. The last area covered at the event was neuromorphic computing, which refers to the process of designing computers to be and function more like the human brain. It has been possible for a while to build neurons in silicon, but now synapses can be added to link them together using the special properties of phase-changing materials. This means that structures found in the human brain can start to be fully replicated in silicon, leading to the possibility of completely new ways of doing computing. But this is still some time away from reaching commercialisation, because the human brain works so differently from a computer processor. It means we need new operating systems, algorithms, software stacks and ways of thinking about how to use this type of computing. There’s a huge amount to learn, but it’s tantalising to see demonstrations of this approach working in the lab. There’s an odd irony in IBM holding Think in Las Vegas, a city that’s designed to exploit the weaknesses of the human brain ruthlessly. Despite this, there’s no doubt that the content of the event is highly thought-provoking.